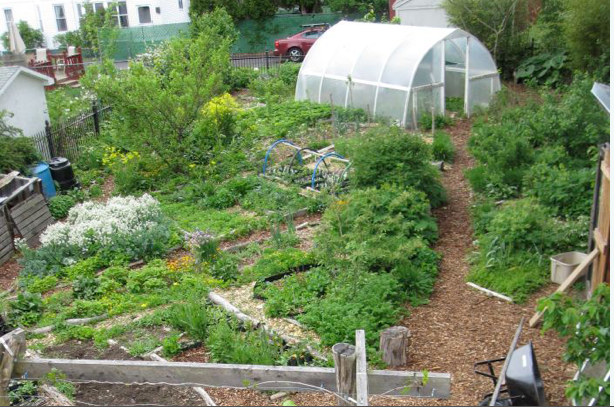 Jonathan, Eric and their families manage a 1/10 acre urban backyard garden in Holyoke, Massachusetts. They have written a book, Paradise Lot together and today they’re co-managing the site in conjunction with their individual businesses. Eric Toensmeier has been involved with permaculture since 1990, and is the author of Perennial Vegetables, and with Dave Jacke, co-author of Edible Forest Gardens. His writing, consulting, and teaching business can be found at Perennial Solutions. Jonathan, conversely, was inspired by his work and life with Eric on Paradise Lot, founded Food Forest Farm Permaculture Nursery, a nursery specialising in educational services and useful/edible plant sales. During the last 10 years, Eric and Jonathan have converted their tiny 1/10 acre suburban backyard into a perennial food garden of exotic plants: a functioning cold-climate urban paradise. They have over 200 food plants in cultivation. Having 40 species of fruit and 70 perennials with edible leaves makes for a long season of foraging. This edible landscape features little-used native plants, as well as useful species from around the world. Many are arranged in an edible forest garden, an edible ecosystem composed of perennial overview polycultures of multipurpose plants. Other distinctive features of the farm include a tropical crop garden, an edible water garden, poultry, annual beds, and a bioshelter greenhouse with aquaponics under development. Their book, Paradise Lot, tells the story of the garden’s development from a bare patch of ground to a diverse and productive demonstration site. Backyard food forest is a perennial system. There is no immediate return: it’s a short-term investment for long-term gain. Nonetheless, they have figured out a way to supplement their income through their project, and are now reaping the rewards. By the 3rd – 4th year the perennial systems started to reproduce a lot, and they started giving away the surplus plants to people and friends. People were interested, and because the plants were rare and exotic, they began to charge 10$ a plant. Today, this is a viable business for Jonathan. Half of the income for his family depends on this business, moving to more than half and full. This is in addition to all the other things they are doing together such as education services – speaking events, presentations, tours, consultations.